Did the Reds really have the worst pitching staff ever? I mean, hell, I don’t know. Their pitching staff had one of the biggest home-run problems ever. By actual runs allowed, they were a little bit better than replacement-level, but you know where we stand on all that. There’s no way to actually compare across seasons or eras, not with the desired level of precision. We just don’t understand pitching that well yet, and we understand it even less the further back we go into history. 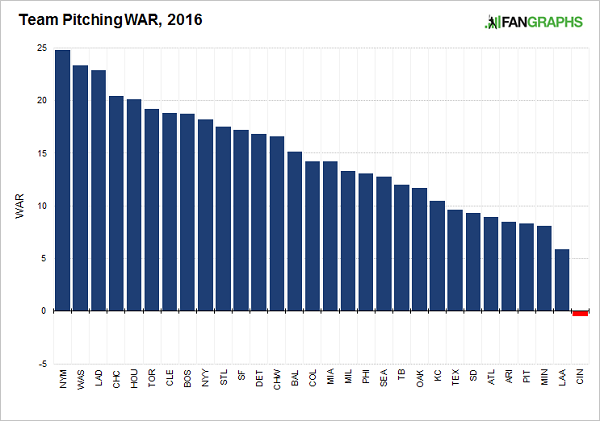 We can say this: If you wanted to talk about the worst staffs of all time, you might use FanGraphs WAR as a starting point. It couldn’t make the Reds look any worse. The first half is what did the Reds in. In the second half, they accumulated 3.2 WAR, good enough to edge out the Twins, Braves, and Diamondbacks. In each of the last three months, the Reds’ staff finished in the black. Yet it’s appropriate that, in the final stretch, they were dead last again. All they needed were one or two more good games, to avoid finishing in the…red. But a league-worst September and October locked the Reds into place. They had a chance to run away from history, but instead they suffer its embrace. A negative WAR. It’s not that there weren’t some success stories. Anthony DeSclafani was pretty good. Dan Straily was all right. Raisel Iglesias adjusted well to the bullpen. Brandon Finnegan got stronger in the second half. But let me tell you: 32 Reds pitchers pitched. Twenty of them finished below 0.0 WAR. Alfredo Simon allowed more runs in 58.2 innings than Jon Lester allowed in over 200. J.J. Hoover allowed more runs in 18.2 innings than Zach Britton’s allowed the last two years combined. For the Reds, 2016 was never going to be about winning. Yet it also definitely wasn’t supposed to be about this. We hoped you liked reading The Reds Actually Did It by Jeff Sullivan!